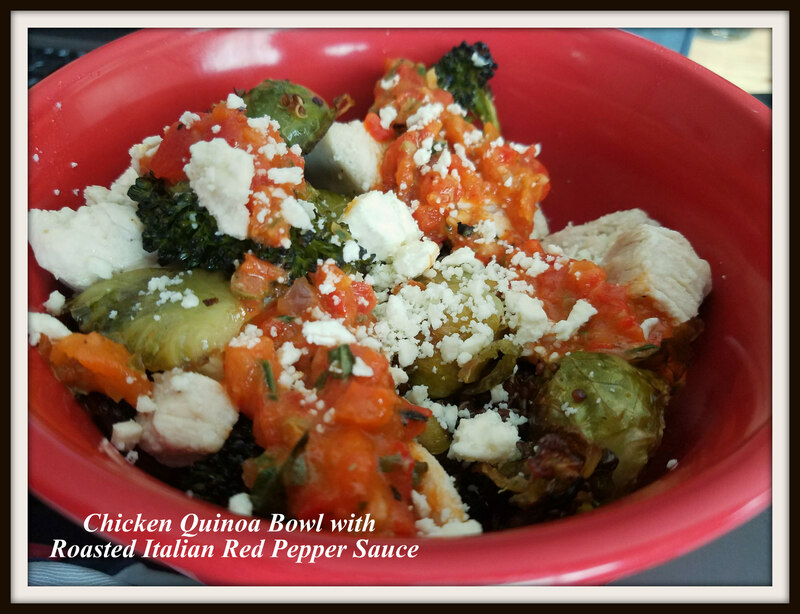 Chicken Quinoa Bowl with Roasted Italian Red Pepper Sauce – What's for Dinner Moms? So even though I am trying to keep meals simple I am still trying to get vegetables and good foods into my family. The great part is that you can make the sauce for this bowl a day or so ahead of time when you have free time AND it will taste even better because all the ingredients get time to blend together and tastes amazing! For me to willingly eat Brussels sprouts and broccoli they need tons of flavor. Roasting the vegetables and adding the Roasted Italian Red Pepper Sauce over the top with a bit of cheese? Perfection for me. The best part is that you make the bowl the way you want. Different vegetables, different base – quinoa, brown rice, noodles, and it makes it a whole new dish each time! Mix all ingredients for chicken in a large zip top bag and move it around to combine all ingredients and coat chicken. Place in refrigerator to marinate at least 2-3 hours to overnight. Blend all ingredients for Italian Red Pepper Sauce in food processor, blender or with a mixer. It is best very smooth. Pour into a bowl and refrigerate for 1 hour. When ready roast vegetables in oven – your choice. Just as vegetables are about 15 minutes from done cook quinoa according to package directions. Remove chicken from marinade with a slotted spoon and cook in a skillet over medium heat with 2 tablespoons of olive oil until slightly browned. Serve hot with quinoa, chicken, roasted vegetables, topped with red pepper sauce and Parmesan cheese as desired. I cannot handle brussel sprouts at all, you’re a trooper. I only ate a few and scooped up lots of broccoli! They have to be cooked just right for me to eat them. Otherwise I think they taste like tree leaves. My family likes them though. Broccoli I like, but brussel sprouts however you dress them are still brussel sprouts. Thank you for sharing, Marci! I love quinoa and this combination sounds great! Thank you! It is taking the kids some getting used to. But, they are slowly coming around. I can imagine that would be the case with my kids as well but I would love it anytime! Oh, yum, sounds really good. I like such dishes. Healthy and tasty! Thank you! It is coming slowly for us. I am trying to get more vegetables in us. Roasting them is the preferred method for my kids right now. You are right, I think rosted makes it a bit more tasty for them. I am eating more healthy food right now and I love it! This sounds so good! A great way to get veggies! Thank you! Hopefully getting them to eat them!